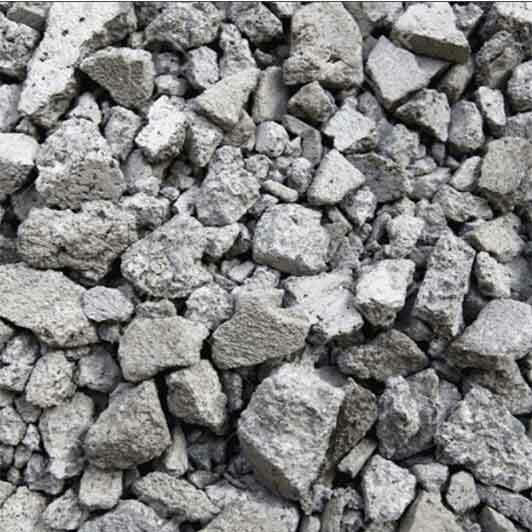 Crushed concrete can be used as material in temporary roads, construction staging areas, drilling pads, building pad caps, construction entrances, drainage fill and flexible base under paving. ​Smaller pieces of concrete can be used as gravel in new construction projects. Sub-base gravel is laid down as the lowest layer in a road, with fresh concrete or asphalt poured over it. The US Federal Highway Administration often uses this material for the construction of new highways. Additionally, large-sized crushed concrete can be used to fill gabion cages, which can then stacked together to provide cost-effective retaining walls. Stacked gabions can also be used to build cost-efficient privacy walls in certain situations. Prior to recycling, old concrete was routinely trucked to landfills for disposal. Greater environmental awareness and protection laws has expanded the common use of crushed concrete to many other commercial construction projects. Crushed concrete rock is used for temporary roads , construction staging areas, drilling pads, building pad caps, construction entrances, drainage fill and flexible base under paving.